JOIN US for a reading at Browsers Bookshop! When Bob Quinn was a kid, a stranger at a county fair gave him a few kernels of an unusual grain. Little did he know, that grain would change his life. Years later, after finishing a PhD in plant biochemistry and returning to his family’s farm in Montana, Bob started experimenting with organic wheat. In the beginning, his concern wasn’t health or the environment; he just wanted to make a decent living and some chance encounters led him to organics. Good Food Awards Tasting Party! Thursday, June 21 5-7 p.m.
Did you know we have FIVE Good Food Award* winners in the Greater Olympia area? That's a big deal & we think it's worth celebrating! So we're getting local winners and their products together so you can taste them all. Come to this free event to taste but also to learn through demos and meet-the-maker opportunities. We'll also have live music! Can't wait to see you there! *What are the Good Food Awards? These yearly awards recognize producers across the country who make "tasty, authentic, responsibly produced food" in 15 categories. The goal of the eight-year-old program is to elevate U.S.-produced craft food and drink. We think it's a great way to call attention to hard work, mindful production, and fantastic flavor. **There will be a small fee for tastes of Whitewood Cider. All other samples are FREE! Our favorite kind of party! Pot up heritage plants including some we're testing for potential inclusion in the Ark of Taste. Take home heritage starts including tomatoes, tomatillos, ground cherries, squash, herbs, Brussels sprouts, cabbage, peppers, and more in exchange for your help. When: May 6 from 1 to 3:30 p.m. If you have them, bring pots, potting soil, and/or starts. We especially need pots and potting soil. You may want gloves and a towel to clean you hands when we finish the work. Non-gardeners are welcome! May There Be Gardens: a GRuB garden-building event! 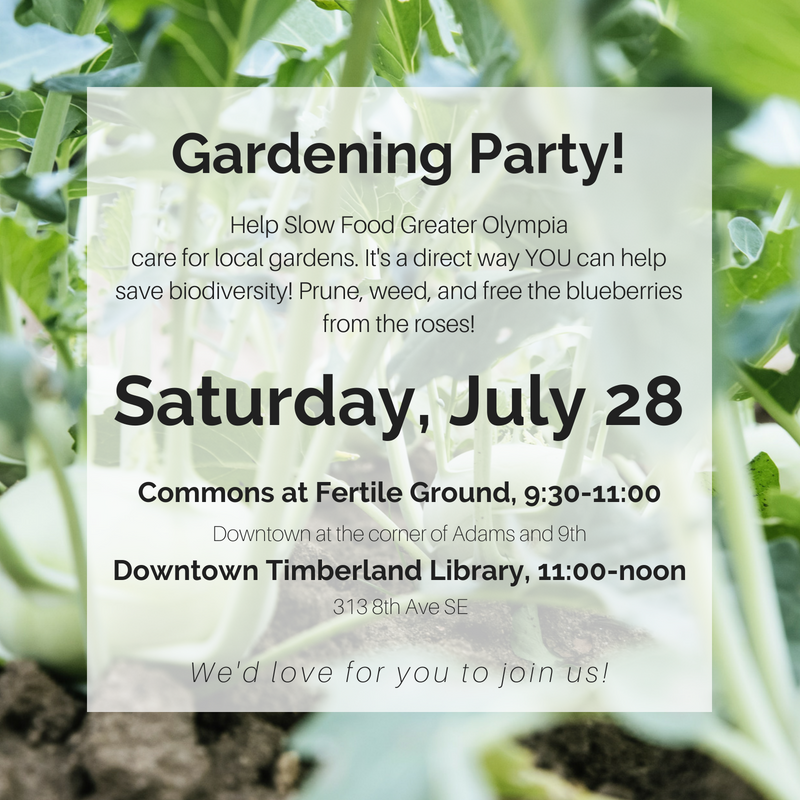 Slow Food Greater Olympia is fundraising and sponsoring a team to help GRuB build 10 backyard gardens in one day! On Saturday, May 5, GRuB will mobilize community members to install gardens and raise money to fund these food-producing, hunger-reducing backyard gardens. As a team, we will raise enough funds to cover the bed we'll build together AND a second bed for another family. That means TWO FAMILIES will receive a garden bed because of your help. 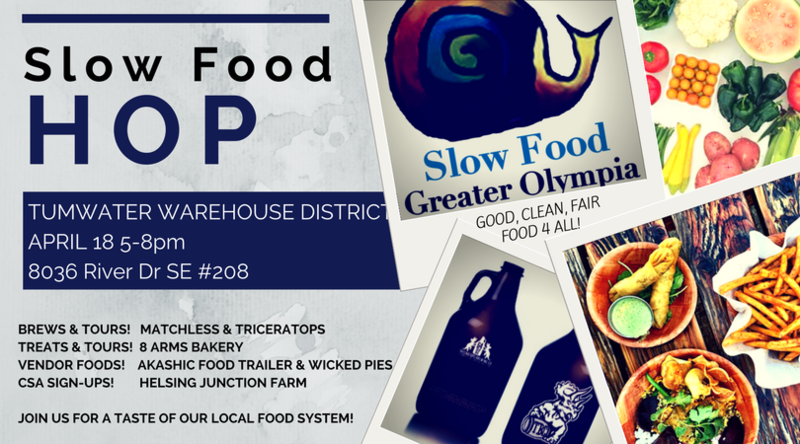 Join us for a taste of the local food system at one of the best spots in Tumwater! When: Thursday, April 18 from 5-8 p.m. Try brews from Matchless and Triceratops, grab a meat or veggie pie and a treat from 8 Arms Bakery, and chat with your food-loving neighbors! And if you haven't signed up for a farm share of local produce yet, now's the time! The folks from Helsing Junction will be there to give you the scoop. See you there! The agenda includes a keynote address by David Bauermeister of the NW Agriculture Business Center, a beer tasting by Fair Isle Brewery, and more! See the agenda on the conference website. Or register right now, right here. Join us for a tour and tasting at Lacey's very own Stottle Winery. We will have a few snacks--feel free to bring easy-to-eat finger foods to share, if you wish. Just $9 per person. Write us to sign up! LOOK & SEE, a portrait of Wendell Berry. The film revolves around the divergent stories of several residents of Henry County, Kentucky who each face difficult choices that will dramatically reshape their relationship with the land and their community. Join us for a discussion and, if you like, a dessert from Sofie's Scoops. Samin Nosrat has written book that is half about the key elements of cooking and half a cookbook with recipes that highlight the lessons. Salt Fat Acid Heat: Mastering the Elements of Good Cooking is available at the Timberland Library. Because of the well-crafted charts the book is not available in e-format. Select one of the four cooking elements as your special interest and come prepared to share what you learned from the Norsrat’s narrative. THE CASCADIA GRAINS CONFERENCE is a daylong event that brings together farmers, bakers, brewers, distillers, brokers, investors, policy-makers, and others to strengthen the role of grains in our local food economy by sharing the latest science, techniques, and developments. Great local food served. Learn more and register here. Registration is now $115 until Jan 6. Plan to bring a delicious local food to share, hear reports from our 2017 Slow Food Nations Delegates, and find out about how SNAP participants can double their food dollar at local farmers markets. Thanks to everyone who joined us at the South Sound Food Summit! It was an incredible weekend of community, learning, and gorgeous food. Find out more about the work of the South Sound Food System Network here. Join Greater Olympia Slow Food for the film "Deeply Rooted: John Coykendall's Journey to Save our Seeds and Stories." The film is a 2017 Suncoast Emmy award nominee and tells the story of John Coykendall's journey to preserve the seeds and stories of a small farming culture in Southeastern Louisiana. For nearly four decades, his passion has been to preserve the farm heritage of his region. This work is the subject of a new documentary from Louisiana Public Broadcasting and was featured at the local Food Summit organized by the South Sound Food System Network. 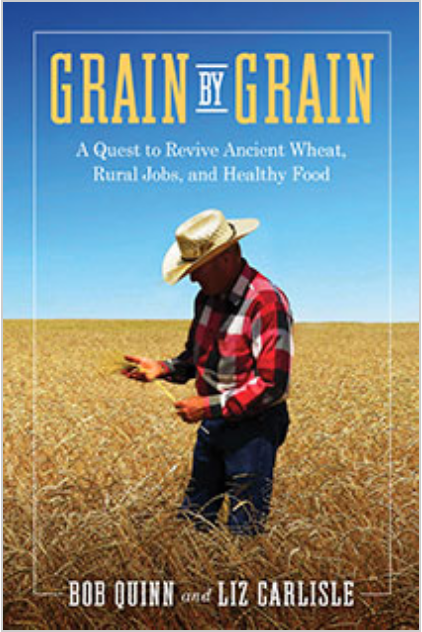 You'll be inspired to learn more about the stories behind the food we eat. All community members are welcome to attend. Eat Better, Together: Bring a movie snack to share! Fresh seasonal fruits provided by Greater Olympia Slow Food. Slow Food means Good, Clean, Fair Food for Everyone! 40 adults and 10 children enjoyed about 20 homemade ice cream, sorbet and related choices on a lovely afternoon in the park. Thanks to Tunawerth Creamery for donating the milk for the half dozen volunteer ice cream makers. May 6 - May There Be Gardens - backyard garden beds that is. and our annual fundraiser for GRuB and May there be Gardens (Formerly Day of the Bed) is upon us. 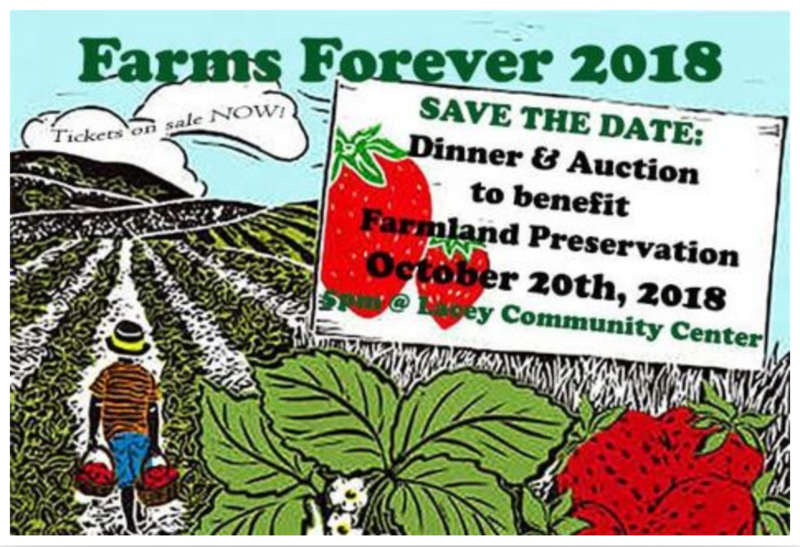 This function represents a key partnership between GRuB and Slow Food and gives us the opportunity to donate our energy and resources to such a wonderful cause and organization. www.goodgrub.org GRuB and our collaboration helps local youth gain critical sustainable food production, life skills and education while supporting our greater community by building raised beds for deserving and needy community members, truly delivering our mission of good, clean and fair food for all. Did we mention this event is fun? Last year we had a blast creating the raised gardens and joining together with all the teams after for incredible food, music and comradery. Our favorite kind of Party! What: Potting Party–Pot up heritage plants including some we are testing for potential inclusion in the Ark of Taste. Take home heritage starts including: tomatoes, tomatillo, ground cherry, squash, herbs, Brussels Sprouts, cabbage, peppers and more in exchange for your help. If you have them, bring any of the following: pots, potting soil, starts. We especially need smaller pots and potting soil. You may want gloves and a towel to clean you hands when we finish the work. Non-gardeners are welcome. When: April 15 from 1 to 3:30 pm. What: Ark of Taste Garden potluck at The Commons at Fertile Ground, Olympia. Bring an item for the potluck plus your dishware. Slow Food will serve heritage tomatoes, fava bean and runner bean paste, roasted parsnips, and Ozette potatoes from our Ark of Taste Garden. Cost: This is a free event for those living near Fertile Ground and those interested in Slow Food. What: Great Yards Get-Together, hosted by the city of Olympia. Slow Food will distribute information on vegetables to be planted in September – garlic and tender greens. Stories from Slow Food International’s biannual conference in Turin, Italy. This year’s delegates, Christine Ciancetta and Jennifer Crain, share inspiration from food luminaries around the world working to strengthen indigenous food systems, biodiversity, women in agriculture, gardens in Africa, the nutritional value of food farmed well, and more. Come mingle, listen, learn and eat with us! When: Saturday, December 10, 2016, 1:00-3:00 p.m.
Join us to hear travel stories and drink wine! Food educator and chef Christine Ciancetta and food writer Jennifer Crain will share tales about this northern Italian region's traditional cheeses, ancient salt beds,and culinary history. Come listen, learn, and try some samples of unusual Italian delights! Where: GRuB Farmhouse (note change of location). What: Learn about and help create plans for 2017. Speaker – Greg Gachowst, Thurston County staff member with a remarkable story about food recovery that serves those in need in our community. Bring: Your favorite local food to talk about and share at the potluck. Dishware provided. Cost: No charge. We are happy to accept small contributions to cover the facilities costs. Parking: The GRuB (Garden-Raised Bounty) Farmhouse is at 2016 Elliott Ave NW, Olympia, WA 98502. Parking is limited in the GRuB lot, but abundant across Cooper Point Rd along Elliot Ave. Your Slow Food Board Nominees for 2017: The following individuals have agreed to serve on the 2017 Board of Directors subject to member approval at the Annual Meeting: Christine Ciancetta, Linda Chesnut, Ginny Codd, Lorrain Cornell, Jennifer Crain, Melissa Davis, Joel Hansen, Treacy Kreger, Olivia Raine, Martha Rosemeyer, Loretta Seppanen, Celeste Wade, Tara Witten and Ben Witten. Please send an email to goslowfood@gmail.com if you too would like to join this active group which meets 6:15 to 8:30 pm on the following Wednesday – Feb 8, April 19, June 14, September 20 and December 6.